This modernist rattle is hand-tuned and made from mirror-finished German silver. This item is meant to be a commemorative keepsake for parental use only. German silver has a color resembling silver, but is an alloy of primarily copper, nickel and zinc. Beautiful, classic baby gift. Soothing chime rattle. I would like to be able to purchase again. Hoping this will be an heirloom for their family. The rattle is a sweet gift that will become a heirloom for families that can be past down for gererations. Super special & delicate. Perfect baby present! Love this, second one that I have purchased for my great nieces. This is the most beautiful "rattle" on the planet. Fine quality and the tone is peaceful and soothing...wind chime quality. This is not your typical baby rattle. It is a chime rattle and has beautiful chiming tones that are soothing to a restless baby and mother. I always give this as a new baby gift. It is unique, practical and timeless. It also can be kept to pass on to the next generation. A really lovely gift. This is the 3rd silver rattle I have purchased. It is a wonderful gift. Baby holds this rattle with ease and the sound is so soothing. Makes a wonderful gift for any occasion or I Love You gift! 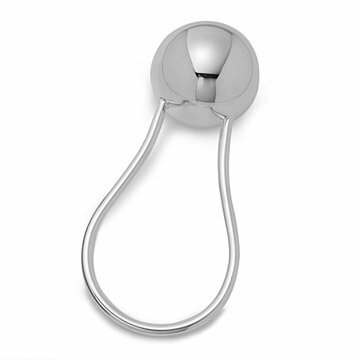 Heirloom quality German metal alloy silver-toned baby rattle. Has a calming, beautiful chiming sound and is easy for baby to hold. Excellent seamless crafted design, however, extremely delicate. The only negative aspect of the rattle is that it dents easily, therefore, impractical for daily use. Better as an heirloom. Price fair for excellent quality and design.